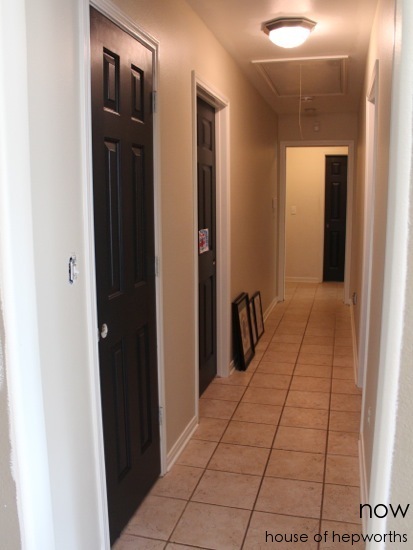 In addition to installing a new kitchen, we also widened two doorways; the game room and the hallway closet. I realized when going through photos that I never shared a before and after of the closet in the hall. Here is the hall before we widened the doorway. The closet is the first door on the left. And here it is open. The closet is very wide, but with only a single door, it made it much harder to utilize the space to the left and right. Our renovation consisted of us doing lots of demo work (to save money) and then our builder’s team putting it all back together. Ben and I pulled the old door out, and then from there the framers came in and widened the door and installed a new header. After that the finishers installed the new pre-hung set of doors. Once the doors were hung the finishers also added all the shelves in the closet. 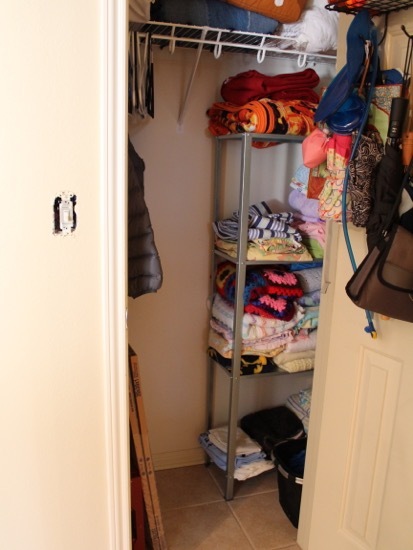 It used to function as a coat closet, but with no linen closets in this house, and the fact that we are in Texas and don’t really need a coat closet, we opted to turn the closet into a big linen closet. Ahh, just look at all of that storage! The closet is so functional now. We had so much stuff piled everywhere, and so much more work to do around the house, so I went ahead and loaded up the closet (of out desperation for space more than anything) even though we hadn’t painted yet. 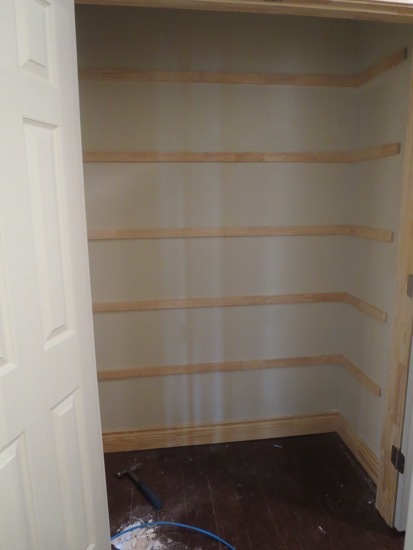 After many MANY hours of painting, I managed to paint all the baseboards, trim, and doors (I still haven’t painted the shelving inside the closet though). Now our new double doors are black to match the rest of the doors in the house. 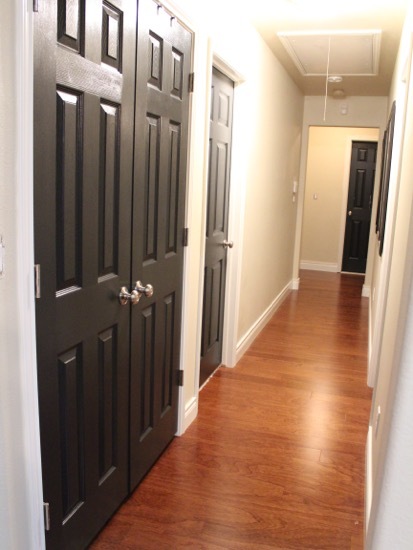 I attached dummy doorknobs on the doors that match all the other doorknobs in the house. Just ignore the “now” on the before photo. I borrowed it from an old post. 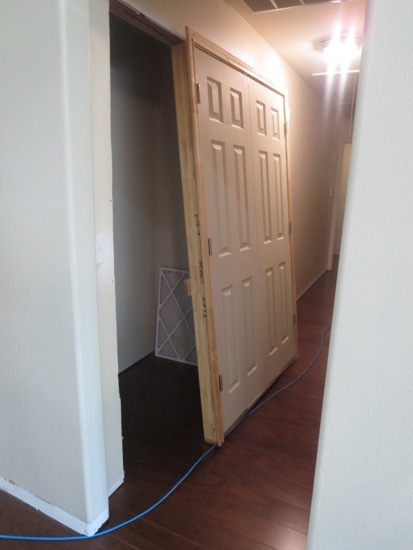 It’s amazing what widening a doorframe will do for functionality. We are slowly taking this house and turning it into our home. So very glad to hae you back. Love the content and that you don’t clutter with parties, blog hops, etc. Some of us really like it simple and real and you deliver! Thanks Karen! I just like blogging, but all that extra stuff really gets in the way. I love your black doors! I have a question about them. When you painted them, what all did you paint? Are the other sides of the doors black, too? 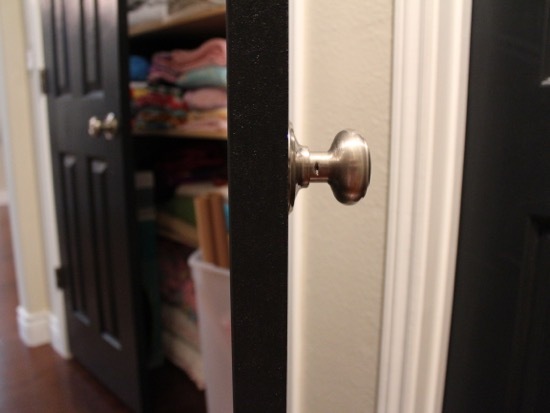 I see from this post that the interior edge of the new closet doors are black. Just need some advice before I take the plunge! I painted the entire door – both sides. It wasn’t fun, but it looks so much more professional that way. I love that! Every stinking closet in my house is how your closet was before you widened the doors. I don’t get it!! The sides go in really deep which is great for storage, but why did they have to make the door itself a single open?? I plan on adding shelves on the sides (since it’s already “walled in” three ways), so that should help. I love the black doors! I really want to see a picture of your game room door (the glass one). Did you ever end up painting it black like you were considering? Callie, yes, I did finish painting it! I went with black (shocker!) because I thought staining might compete with the floors. It is finally totally done with new knobs too so I will share Thursday. What a GREAT idea. This makes way more sense. I’m so glad your blogging again. I really missed you!!! That just makes so much sense, to put a double door there. 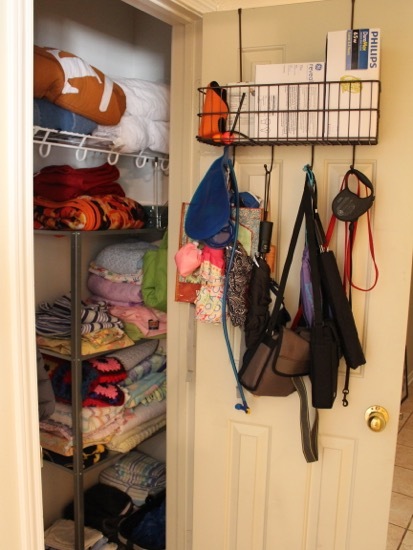 I am jealous… you don’t need a coat closet! We have so many winter coats, boots, ski pants, hats, mitts, etc. that take up a lot of room. Plus we are in the middle of a snow storm. I love it! 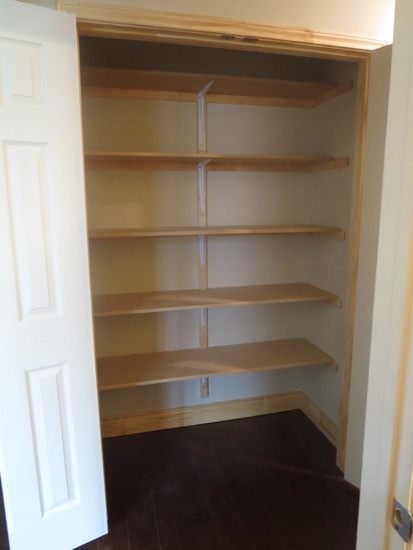 Now suffering from closet envy… My new house doesn’t even have one of those useless mini coat closets my old double-wide had! Who designs these closet-less houses? Where do I put the vacuum cleaner, much less the coats?! I couldn’t agree more. 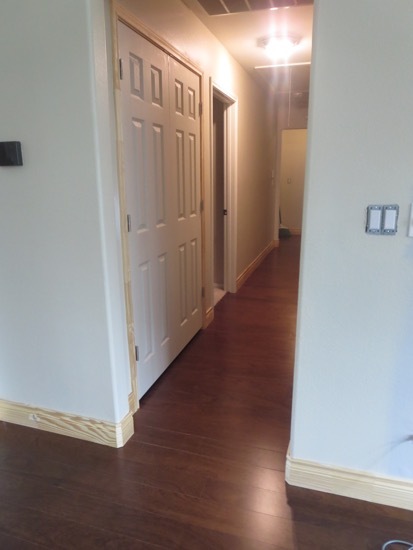 I’ve racked my brain trying to find a way to squeeze an extra closet into this house without costing a fortune or doing a full addition, but can’t come up with one. I need a big walk in storage closet! I LOVE what you did with the closet doors! We have 2 closets in this house that need the same treatment. But I’m also puzzled. 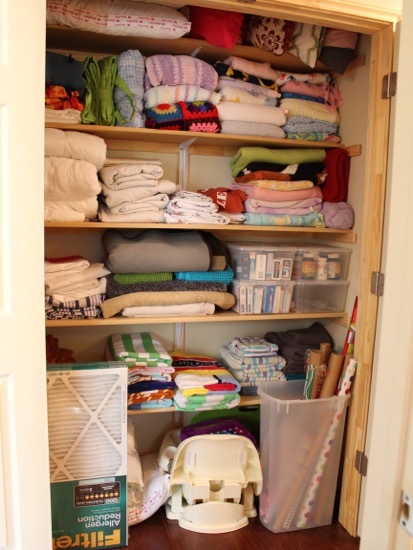 We, too, live in Texas, and I can’t imagine NOT having a coat closet! We don’t keep parkas in ours, like many in the snow-burdened north, but we DO have rain coats and winter coats that we don’t keep in our bedroom closets. I DID however, decide that it doesn’t need to be a full length hanging rod. I moved it down and put additional shelves (for storage) above. We have a few coats that do need to be hung up, so for now we hang them on hooks in the laundry room (https://www.houseofhepworths.com/2015/01/26/curtain-tiebacks-as-mudroom-hooks/). Eventually I’m going to hang a rod in the mud room for all the coats. The closet is awesome! It is very big and spacious. I love closets like this one! Greetings, Storage Perivale Ltd. The closet looks great with the double door! Great job! Now you have such a wonderful storage! Greets!